The Spanish team fell short of its goals to place at least one rider on the podium, although it won two stages and the team prize. A three-week harvest of two stage wins, the points jersey, a top-5 overall, and the team prize would be a great Vuelta a España for just about any team, except Movistar. The Spanish super-team leaves the Vuelta with mixed emotions. Movistar was a player in every facet of the race, but it fell short of its goals. When Spain’s lone WorldTour team is racing on home roads with two of the pre-race favorites, anything short of overall victory is a disappointment. Movistar leaves the Vuelta without a grand tour victory or podium for the entire season. A fourth-place result by Richard Carapaz at the Giro d’Italia was its best all season. For most teams, two top-5s in grand tours would be a step in the right direction. Not if you’re Movistar, a team accustomed to racing for the biggest prizes in grand tours. What happened during this Vuelta? As Valverde put it, others were simply better. Valverde, who suffered a career-threatening knee injury in a crash in the opening stage of the 2017 Tour, surprised at every turn. The 38-year-old came to the Vuelta to prepare for the worlds, but he grew into the most serious challenger to Yates. He won two stages in the first week and clawed to within one second of the red leader’s jersey. Valverde emerged as the most direct threat to Yates, just 25 seconds back going into the final weekend. The wheels came off the Movistar wagon for good in Andorra. Movistar tried an aggressive tactic to knock Yates off balance, but it was the Mitchelton-Scott rider who punched first and knocked Valverde off the final podium. Valverde, however, leaves the Vuelta emboldened for the upcoming world championships. Valverde held up his end of the bargain, so it’s Quintana who will be wondering what happened. The Colombian, who won the Vuelta in 2016, faded in northern Spain during three decisive climbing stages across the Cantabrian Mountains. Quintana looked poised to move into the red jersey after a solid ride up La Camperona, but he fell back at Les Praeres and suffered even more losses at Lagos de Covadonga. By the time the race hit Andorra, however, he was in full domestique mode to try to help Valverde salvage the team’s ambitions. Quintana isn’t paid to be a super domestique. With an eighth overall and a 10th at the Tour de France this summer, 2018 marks the first time the Colombian did not hit a grand tour podium since his grand tour debut in 2012. Every year since then, he’s at least finished on a grand tour podium (and won two along the way) in 11 starts. Movistar took some consolation in the team prize and in how it carried itself throughout the Vuelta. Movistar will try to get its ship back on course for 2019. Mikel Landa, who was seventh at the Tour despite a crash, will be back with untapped ambitious. Valverde will be riding out the last year of his contract and perhaps the final season of his career. The pressure will be on Quintana, who turns 29 next year, to demonstrate that he can still win a grand tour. Crashes and other mishaps took their collective toll on the team’s stars in 2018. 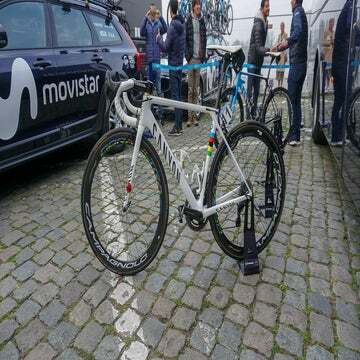 Movistar is hoping it can produce the victories that its fans and sponsors expect and demand.